Did you ever ask Santa for a pinball machine? Did you ever hope to find a drum machine under the tree? 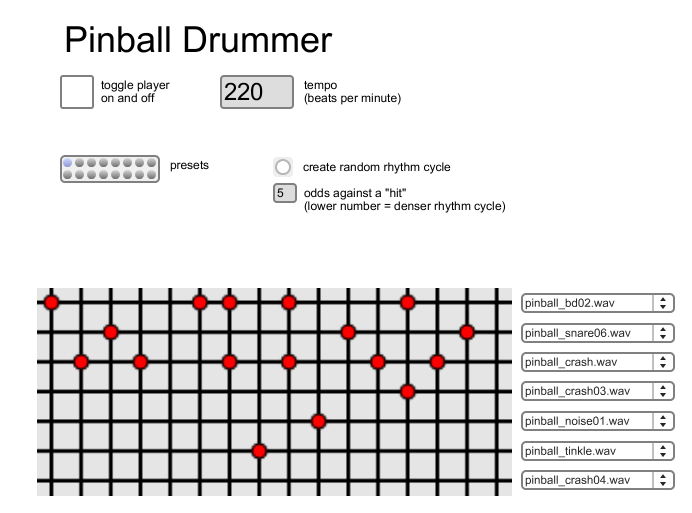 Now both of your wishes can come true (sort of) with Pinball Drummer, a simple, standalone drum machine that uses lo-fi pinball machine samples. I made Pinball Drummer as a birthday gift for my friend Bruce. I created it using MaxMSP. The sounds originated from Bruce’s Coney Island pinball machine. It should be a cross-platform application. I’ve tested it on Macs; no experience with running it on a PC, yet. Happy Holidays from The Field Guide! This entry was posted in Music, Software and tagged bruce, drum machine, MaxMSP, pinball, Software by Holland Hopson. Bookmark the permalink. Holy crap this is awesome! Merry Christmas indeed! Bruce has sent a correction: the pinball machine is the Cyclone. See the Internet Pinball Machine Database for details.